When only the best will do, the Premium HD Plus is an advanced HD FTA satellite receiver and intergrated media centre. Earn 350 SATVantage Rewards points with this purchase! The AzBox Premium HD Plus is a DVB-S2 satellite receiver which includes a single tuner upgradable to dual tuners with a display resolution of up to 1080p. It includes a fully featured media center where you can easily playback any Video and Audio files such as XviD, MPEG2/4 and MKV files. Enjoy Internet freedom with an integrated Internet browser, YouTube player, FTP client, and RSS reader where you can keep in touch with the latest news and headlines. 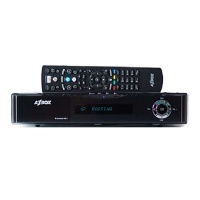 The AZBox Premium HD Plus is a TWIN PVR HD receiver which allows you to watch a channel while recording another at the same time by adding a secondary tuner module (not included). The AZBox Premium HD Plus is equipped with a Wi-Fi module that allows you to connect to Internet wirelessly (802.11 b/g networks supported). Also, the AzBox Premium HD Plus supports various wireless network encryption options, from WEP to WPA2. Channel related information and system operations are displayed via the 11-digit vacuum fluorescence display (VFD) on the elegant front panel of the receiver. The Blind Scan function lets you scan for new or temporary feed channels on any satellite even if the transponder information was not previously entered or is unknown. You may specify a specific frequency range to scan and the AzBox Premium HD Plus will find any active DVB-S or DVB-S2 transponders. The AzBox Premium Plus is also a Media Player with full functionality for media of our modern days. Music, Photos and Video are easily played and accessed which allows you to play your favourite music, view your photos and watch your movies. You can also play many advanced and High Quality Audio and Video formats such as XVID, MKV and AC3. AzBox Premium HD Plus is capable of reproducing High Definition content in 1080p resolution. With this format, you can enjoy the highest quality content in the comfort of your home. Watching TV will become a totally new experience with a crystal clear image, as if it were happening in front of you. The AzBox Premium HD Plus will also upscale standard definition content to 1080p for maximum picture clarity with today's modern televisions. The Electronic Program Guide allows you to schedule recordings of your favourite programs for later viewing. You may also schedule a watch list that will remind you and change the channel automatically for your favourite shows! The AzBox Premium HD Plus is equipped with one card reader that provides a wide range of decoding options in order to support any future developments in encryption standards. IPTV on the AzBox Premium HD Plus is easy to configure and use. Your IPTV channels will be included on your channel list, and you can browse through them among the other TV channels or separately on its own list. Try the new generation of content distribution on your AZBox HD. Thanks to your AzBox Premium HD Plus, you will not lose any critical scenes of your favourite show if you need to leave the room. By simply activating the Time Shift function, your program is paused and can be later resumed at your convenience from that exact moment on. You may also record shows either manually or by scheduling a recording ahead of time. With the AzBox Premium HD Plus, you have time on your hands! The AzBox Premium HD Plus includes a File Browser which allows you to browse files not only from local drives attached to the unit but any shared folders on your network as well. You may easily copy or move files between drives and even play media directly from a shared folder on your network! AZBox HD models include an integrated Web Browser that allows you to surf the Internet on your TV, using only your Remote Control. You can store your Favourite sites in a Favorites list, adding any site to that list is just a click away. Increase your Web experience with AZBox HD. With AZBox HD, it is possible to watch YouTube videos on your TV, the easy way. You do not need to use a browser, just set your preferences in the categories menu, and you are ready to enjoy the wonders of YouTube full screen on your TV! AzBox HD models are capable of reading RSS feeds. This option is fully customisable by the end user in various ways, enabling you to add any kind of RSS feeds provided by web sites as on-line news, blogs, among others. The AzBox Premium HD Plus also includes an integrated FTP Client which allows you to connect to any FTP server and either upload or download files from/to your unit's hard disk. AZBox Premium HD Plus is equipped with a high level of connection options: 2 USB 2.0 connectors that allow users to connect portable media or external USB HDD, an internal compartment allows you to install an internal SATA HDD of up to 1000 GB in size, HDMI (High-Definition Multimedia Interface) output to enjoy the best picture and audio quality in Full HD 1080p, digital optical audio output, Composite video (YPBPR), Composite video and stereo audio RCA.